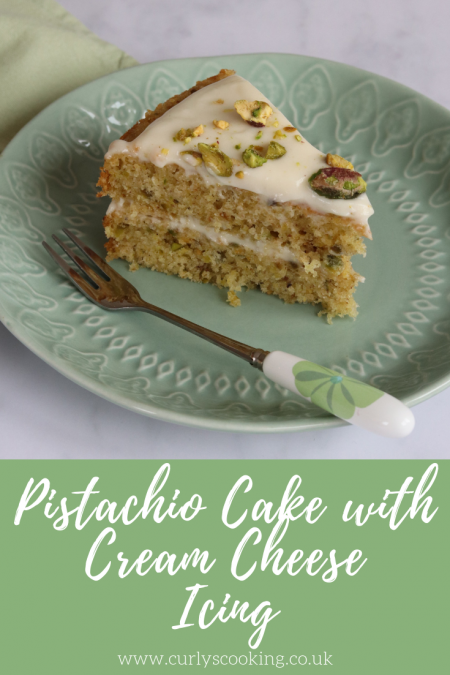 Light and fluffy sponge with the subtle flavour of pistachios and silky smooth cream cheese Icing. This Pistachio Cake with Vanilla Cream Cheese Icing is one of my family’s favourites. Each year I try to come up with a new birthday cake idea for my sister. Her birthday is at the start of April which means it unfortunately falls before Easter and therefore during lent. For years I have told her that I won’t make her a chocolate cake because I give up chocolate for lent. This year, I wanted pistachios to feature in the cake because she loves them. 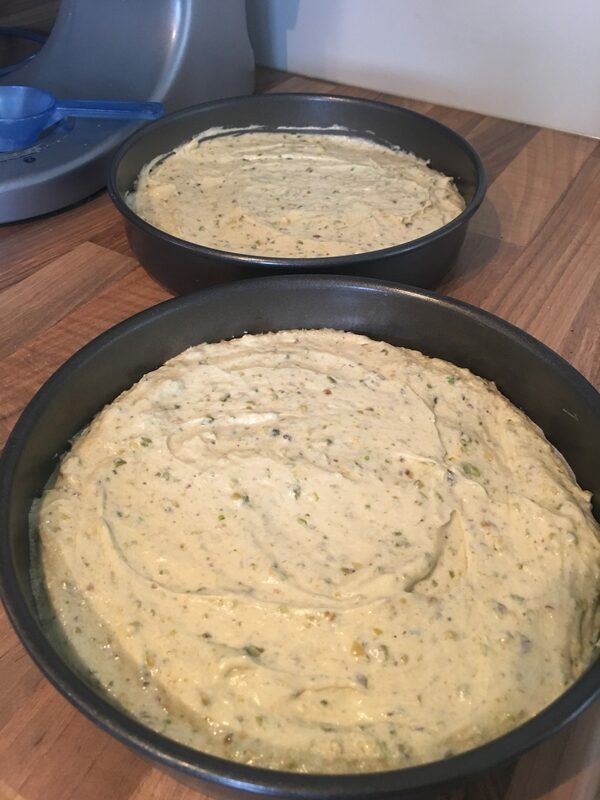 I started looking online and found a few different recipes for pistachio cakes to get some inspiration. I came across a Good Food recipe which sounded like it would be perfect after I had made a few tweaks. Another possibly strange reason I wanted to use this recipe as a guide was that the comments weren’t that great. They were generally mentioning that the recipe was very unclear and confusing. 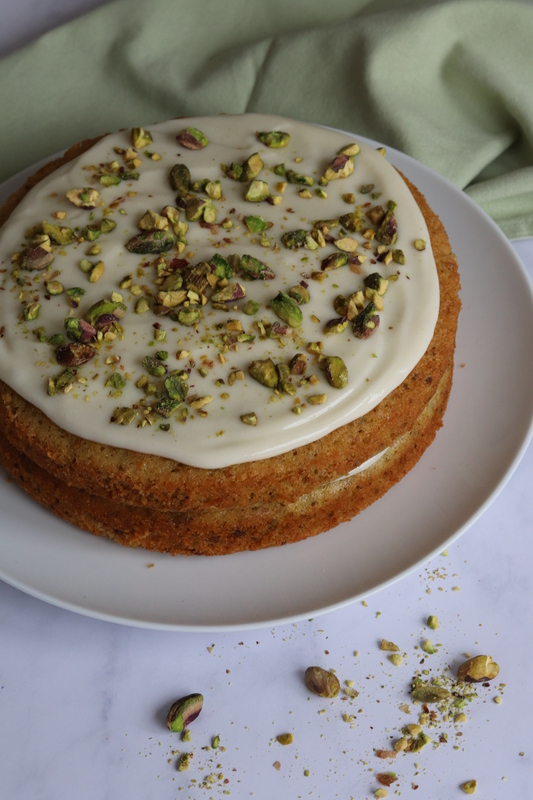 So I took this as a challenge to tweak it and come up with my own, clearer recipe which is how my Pistachio Cake with Cream Cheese Icing was born! My sister isn’t the easier person to please with her cake preferences as she doesn’t tend to like buttercream or jam. So this cake is perfect because it has a cream cheese icing. I’m deliberately referring to it as icing as it is a lot thinner than buttercream or frosting usually is. This is because it is literally cream cheese, icing sugar and vanilla. The lack of butter gives it a silky smooth and delicate flavour, but also doesn’t provide much thickness. I don’t think this is a problem, it just means you need to take a little bit of care when spreading the icing. 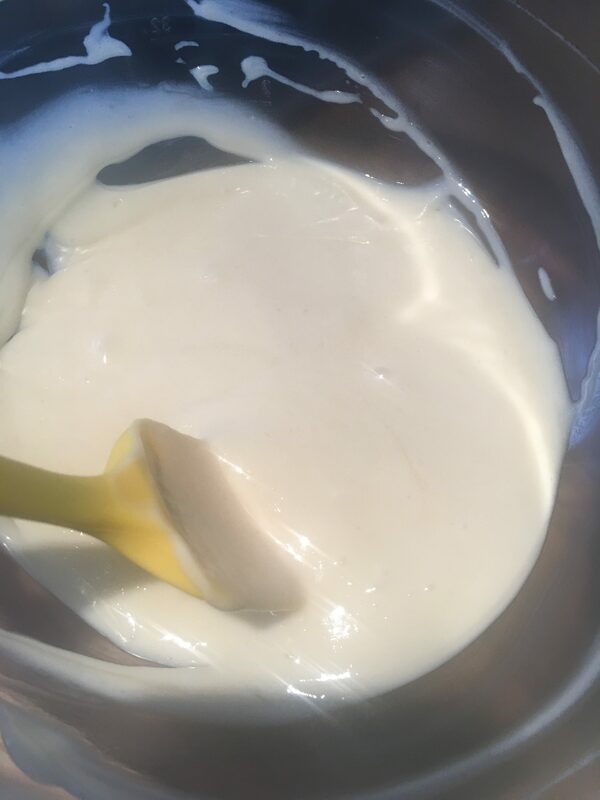 If you start by spooning the icing into the middle of the cake and gradually encouraging it towards the edges then you will be able to cover the cake beautifully. It definitely isn’t the type of icing you can pipe on top of the cake. Personally, I like the simplicity of the decoration of the cake and it means you don’t have to worry if you don’t have any piping skills. This cake is very simple to make and very quick too. 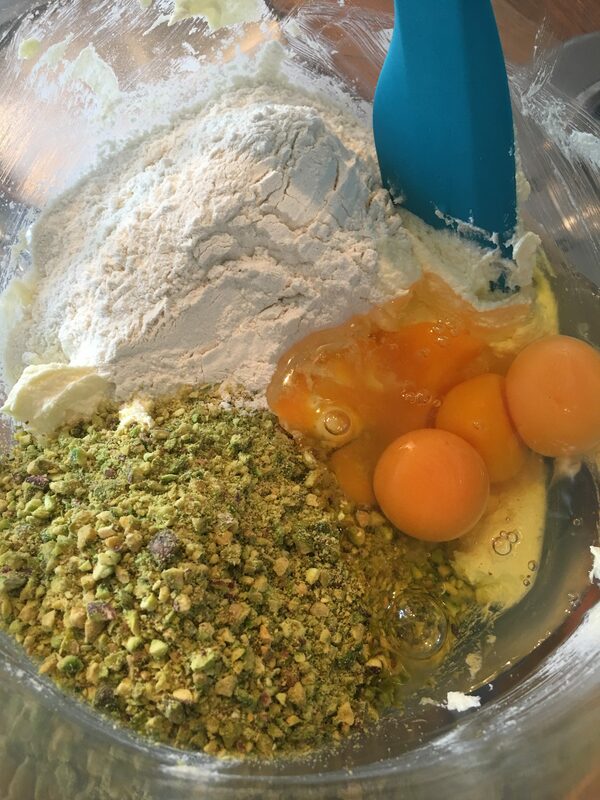 Apart from blitzing the pistachios, you really only need to mix the ingredients together and spoon it onto the tins and you’re done. Sometimes you do want to spend hours creating a work of art, but on the other hand there are also times when you want a quick cake that still tastes delicious. The first time I made this cake, I took it to Nando’s where we were meeting my family for a meal to celebrate my sister’s birthday. When they brought out the cake at the end of our meal, you could see that a few other diners quite fancied a piece! Most importantly my sister really liked the cake and it has become a firm favourite in my family. I love the flecks of green that the pistachios bring to the cake. They are a lovely contrast to the white cream cheese icing. 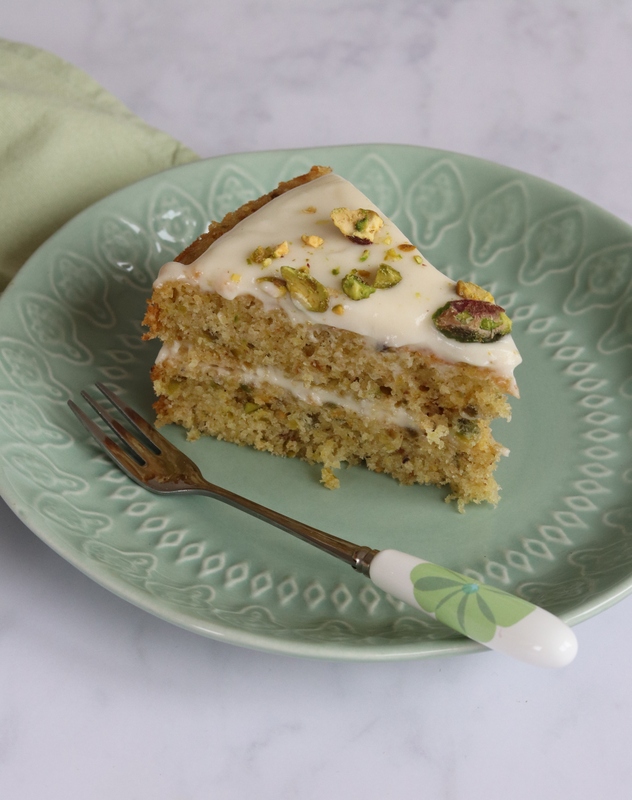 If you like pistachios, you need to give this cake a go! This entry was posted in Cakes on May 28, 2015 by Curly. Wow that looks so moist! And the icing in the middle (and all around) is perfect! I bet the people in Nandos were jealous – I am! Thanks 🙂 Haha yes we did get a few jealous glances. It was a really tasty combination of flavours! Can I use a regular flour? You could try using plain flour with 2 tsp baking powder so use 3 tsp in total. I haven’t tried this though so can’t guarantee it would definitely work I’m afraid. Thank you 🙂 It’s really simple to make too! I’ve received lots of compliments about this cake so it would definitely be worth a go! Thank you 🙂 that’s very nice to hear. Its very frustrating when a recipe is slightly confusing and you end up missing an ingredient out! I found a link to your blog on the original recipe page and have to say I’m very glad I found your recipe! I have to bake a cake for a charity event soon and definitely going to have a go at this! Thank you very much for making it easier to understand! Im glad someone fixed the original recipe, however, you tell us to add the sugar twice, which might be almost as confusing as not adding the butter. Really sorry about the error, I completely understand your point and it was very confusing!